During the Spring Term, Reception Class have been learning all about different Fairy tale stories. 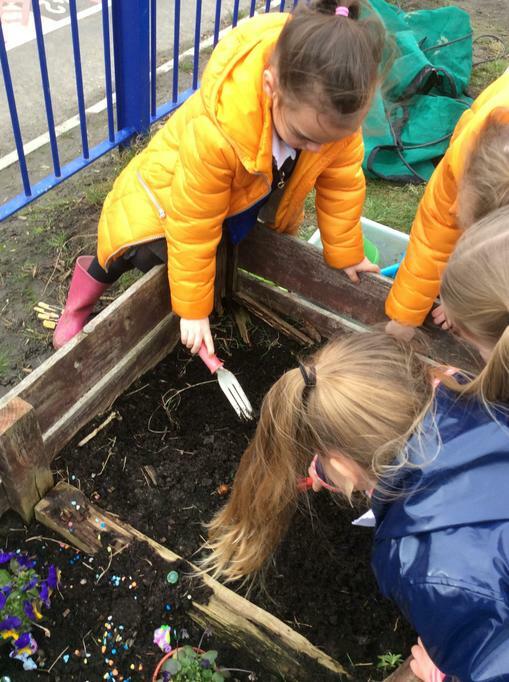 The children have been reading and exploring the worlds of; The Three Little Pigs, Goldilocks and the Three Bears, Jack and the Beanstalk, The Gingerbread Man, Rapunzel and The Three Billy Goats Gruff. 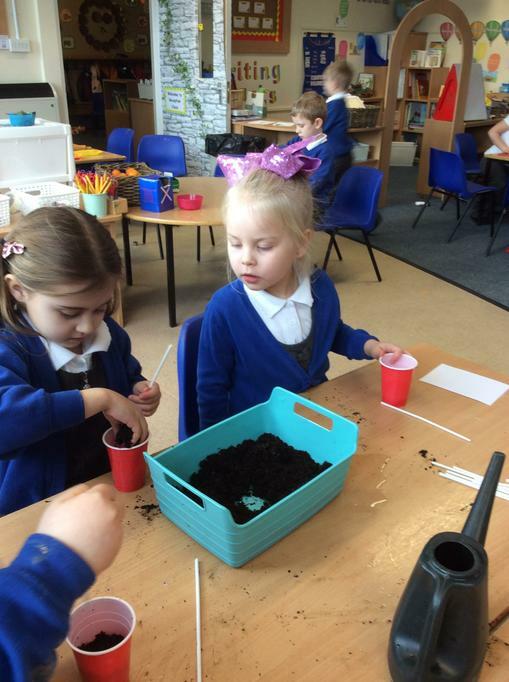 We have enjoyed investigating, exploring, creating, building and discovering new things during our topic. During our Literacy time we have been doing lots of fantastic writing including; retelling a story, changing the end top stories, describing characters, acting out the stories and asking the characters lots of questions. In the Construction Area, we have enjoyed building bridges for the Three Billy Goats, building enormous beanstalks, tall towers and a huge castle for the giant. We have been making lots of lovely things like paintings of the characters, impressive models and even delicious gingerbread men biscuits! Working together to create the Three Bears' House. Don't forget to add the roof! The Three Bears all cosy and ready for porridge. Not too hot. Not too cold. Just right! 'Fe. Fi. Fo. Fum. Who is in my castle? 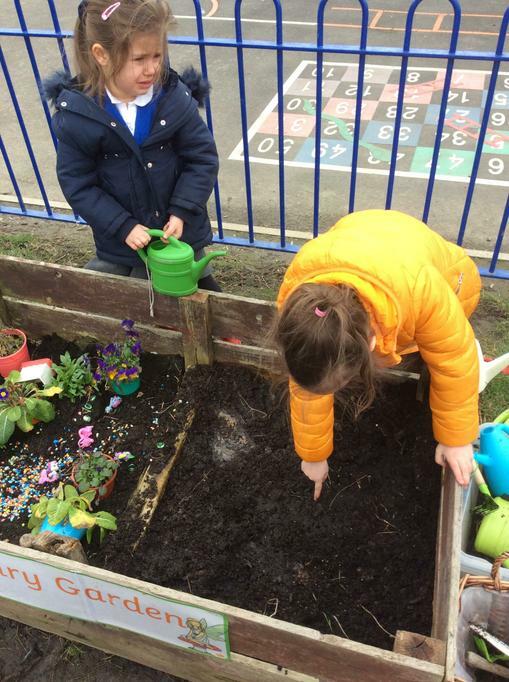 During February, Reception class had a very special week of Chinese New Year! We enjoyed learning all about the festival and what people do during the celebration. We read a story called, 'A dragon in the City' and we first wrote and shared lots of questions we wanted to ask Bo and her family about how they celebrate this special time. We made lots of fierce dragons, colourful lanterns, we painted pictures using golds, reds and yellows and we tried writing our own Chinese numbers - so of these were easy but others were quite tricky! But we loved the challenge! James hard at working making his festival lantern! Isaac and Mason used super cutting skills! 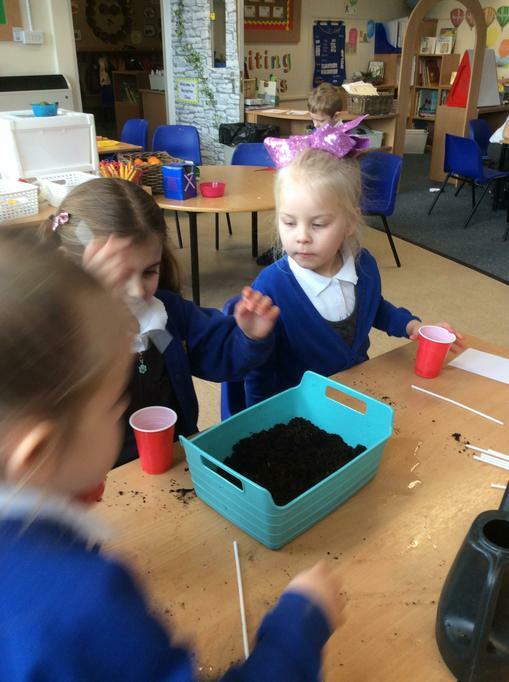 During our Jack and the Beanstalk week, we planted our own beanstalks. 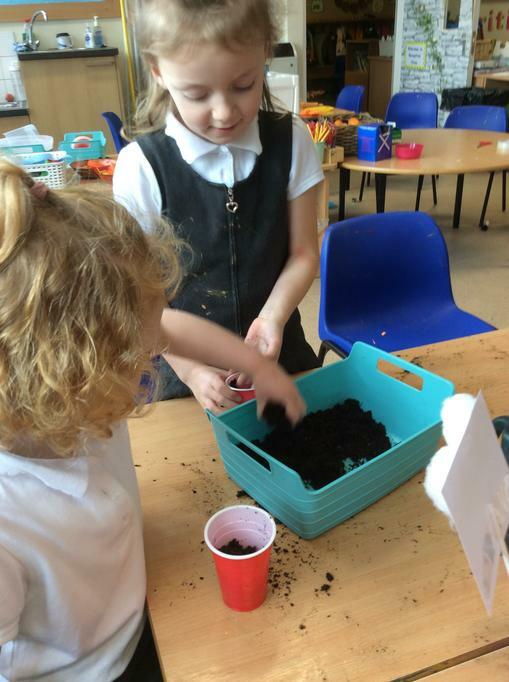 We had to make sure the beans had lots of fresh soil, water and sunlight to help them grow. 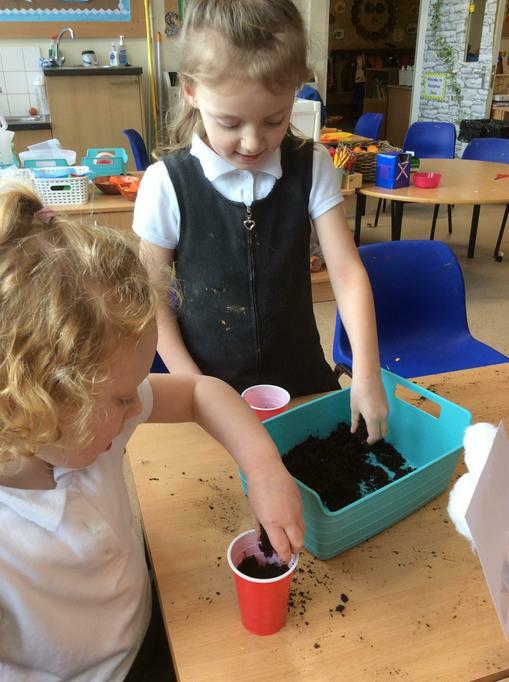 We have been watching our beans very carefully each week to see how much they have grown! We even wrote our own bean diaries to write about how well they have grown each week. 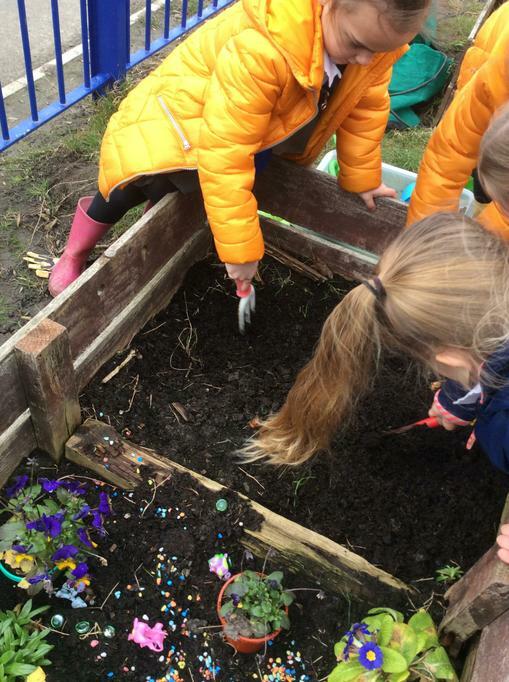 Since then, we have planted our own vegetable patch in the outdoor area just like in the witch's garden in Rapunzel! 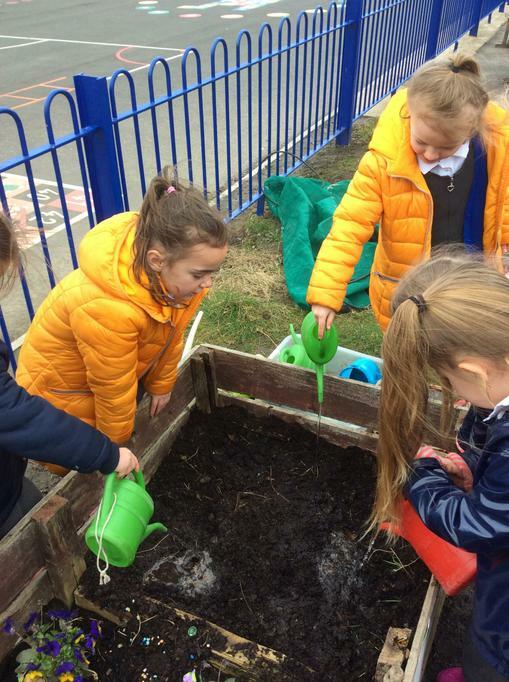 We will keep watering everyday to see how well the carrots and peas will grow. During Fairtrade Fortnight we enjoyed trying lots of delicious Fairtrade food including; chocolate, dried apricots, dried mangos, bananas and other dried fruits. We thought these foods were delicious and we were very excited to try new things. We also talked about what Fairtrade is and how it helps lots of people all around the world! In Reception class we thoroughly enjoyed World Book Day. It was an exciting day for all as we each dressed up as our favourite storybook characters. We did lots of activities through the day including; writing our own stories, drawing pictures of our characters on the computers using 2Simple and making models from our favourite stories. We had a special treat at the end of the day where two of our parents came to read us a story. We really enjoyed and this and we would like to send out a BIG thank you to those parents for coming in on our special day! On World Maths Day we had lots of tricky and exciting challenges to do based around triangles. We made lots of triangle pictures, we looked for triangles in our environment and we use objects to make our own triangles. We also had lots of fun at the Maths cafe event, where some of the children's parents came to hear about how Maths works in the Early Years setting. For our triangle focus we worked with our adults to make lots of different triangles using different objects and resources. Thank you to all of the parents who came to the Maths Cafe event! Isla's very creative triangle pictures! Mason's excellent and different sized triangles! Kate's fantastic triangles AND stars!